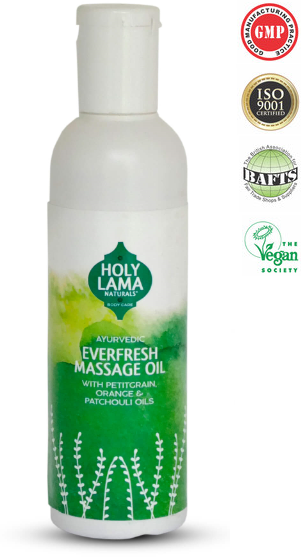 This refreshing Everfresh Fair Trade massage oil by Holy Lama Naturals is an Ayurvedic massage oil made with a blend of coconut, sesame, sweet almond, jojoba and petitgrain, orange and patchouli essential oils. Everfresh Holy Lama massage Oil helps you to be sharp and determined, with a balancing, cooling and smoothing effect on the skin. Ingredients: INCI: Helianthus Annuus Seed Oil, Sesamum Indicum Seed Oil, Cocos Nucifera Oil, Prunus Amygdalus Dulcis Oil, Simmondsia Chinensis Seed Oil, Tocopherol, Citrus Nobilis Fruit Oil, Citrus Aurantium Dulcis Oil, Pogostemon Cablin Leaf Oil, Linalool, D-Limonene, Citral, Citronellol, Geraniol.